Release Tuesday brings us more titles out on the market and we've scoped out the deals on them along with upcoming PC game deals. The first notable batch of new games for 2013 hits the shelves this week. Everywhere you go DMC: Devil May Cry is just available for the $59.99 list price except for a Best Buy combo with Resident Evil 6 for only $9.99 extra. This is a decent offer since the lowest price online for Resident Evil 6 is $36. The newest Borderlands 2 DLC Sir Hammerlock's Big Game Hunt is available today, and Green Man Gaming has it 20% off after coupon. And if you thought PC gamers had it good with the Bioshock Dual pack on Steam, BioShock Ultimate Rapture Edition is released today for PS3 and Xbox 360. It bundles Bioshock and Bioshock 2 with extra bonus content for $29.99. It appears to be sold out at most retailers but J&R has it on order and a buck off at $28.99 (hey you take what you can get). Green Man Gaming has a 25% off coupon for pre-order PC downloads and a 20% off coupon that works on most games on their site. Many pre-order titles come with credit or cash back bonus offers, which are in addition to any coupon discounts. These coupons expire January 18th at 11AM EST. 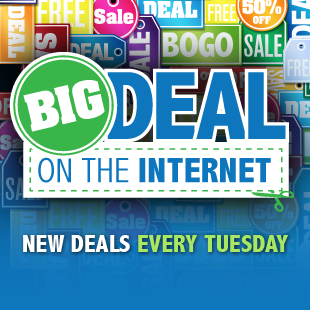 There are a total of 61 good deals this week. Here are a few notable ones: Best Buy has Borderlands 2 on the Xbox 360 and PS3 consoles for only $29.99 (second lowest price ever only to $25 for a few hours on Black Friday); Diablo III is Best Buy's Tuesday "Deal of the Day" at a respectable $34.99; Amazon has the Capcom Digital Collection (8 classic arcade games) on Xbox 360 for $11.99; and finally NewEgg has Mass Effect 3 for only $16.99 on 360. Borderlands 2: Sir Hammerlock's Big Game Hunt (PC DLC) - $8 (US) and Â£6.40 (UK). List is $4 (USD). This activates on Steam. DMC: Devil May Cry (Xbox 360, PS3) - $59.99 and can be bundled with Resident Evil 6 for an extra $9.99. BioShock Ultimate Rapture Edition (Xbox 360, PS3) - $28.99. List is $30. Jan. 18: SpellForce 2 - Faith in Destiny Scenario 2: The Golden Fool - $3.20 (US) and Â£2.80 (UK). List is $4 (USD). This activates on Steam. Jan. 22: Rush Bros. - $7.47 (US) and Â£5 (UK). Next best is $10 at GameFly. Jan. 25: DMC: Devil May Cry - $37.50 (US) and Â£22.50 (UK). Bonus offer of $3 credit or $2 cash back. Next best is $50 on Steam (USD). This game activates on Steam. Jan. 31: The Cave - $11.25 (US) and Â£7.50 (UK). This game activates on Steam. Feb. 5: Dead Space 3 Limited Edition - $45 (US) and Â£30 (UK). Bonus offer of $2 credit or $1 cash back. List is $60 (USD). This game activates on Origin. Feb. 12: Aliens: Colonial Marines - $37.50 (US) and Â£26.25 (UK). Bonus offer of $3 credit or $2 cash back. Next best is $45 at Amazon (USD). This game activates on Steam. Mar. 5: Sim City: Limited Edition - $45 and has a bonus offer of $2 credit or $1 cash back. List is $60. This game activates on Steam. Mar. 12: Sniper Ghost Warrior 2 - $24 (US) and Â£18.75 (UK). Bonus offer of $2 credit or $1 cash back. List is $30 (USD). This game activates on Steam. Early 2013: Company of Heroes 2 - $45 (US) and Â£30 (UK). Bonus offer of $3 credit or $2 cash back. List is $60 (USD). This game activates on Steam. Chivalry: Medieval Warfare - $10 (US) and Â£6.20 (UK). Next best is $25 at GameStop (USD). This game activates on Steam. Deponia - $4 (US) and Â£3.20 (UK). List is $20 (USD). Krater - Collector's Edition - $3.20 (US) and Â£2.40 (UK). List is $20 (USD). This game activates on Steam. Little Big Adventure - $1 (US) and Â£1 (UK). List is $5 (USD). Madden NFL 13 (Wii U) - $39.99. Next best is $52 at JR.com. Deal expires January 19. Hitman: Absolution (PS3, Xbox 360) - $39.99. Next best is $53 at Overstock.com. Diablo 3 (PC/Mac) - $34.99. Next best is $52 at Amazon. Deal expires today. Forza Horizon (Xbox 360) - $29.99. Next best is $50 at NewEgg. Borderlands 2 (Xbox 360, PS3) - $29.99. Next best is $35 at Amazon but normally $50. Last Thursday's release: Droid Assault (PC Download) - $7.99. List is $10. Deal expires January 17. Primal Fears (PC Download) - $8.99. List is $10. Deal expires January 16. Mar. 26: The Walking Dead: Survival Instinct (PS3, Xbox 360) - $49.99. List is $60. Warhammer 40k: Dawn of War II Complete Pack (PC Download) - $29.99. Next best is $60 at GamersGate. The Sims 3 Showtime Katy Perry Collector's Edition (PC Download) - $15.99. Next best is $40 at Amazon. The Sims Medieval (PC Download) - $7.99. Next best is $19 at Amazon. LEGO Lord of the Rings (PC Download) - $9.99. Next best is $20 at Amazon. Naruto Shippuden: Naruto vs Sasuke Exclusive Collection (Nintendo DS) - $15.86. Next best is $31. Capcom Digital Collection (Xbox 360) - $11.77. Next best is $22 at NewEgg. You Don't Know Jack (PC Download) - $2.99. List is $20. Battlefield Bad Company 2 Ultimate Edition (PS3) - $19.99. Next best is $25 at Amazon. Mass Effect 3 (Xbox 360) - $16.99. Next best is $27 at Amazon. Deal expires January 16. Star Ocean: Last Hope International (PS3) - $16.99. Next best is $37 at TigerDirect. ICO and Shadow of Colossus Collection (PS3) - $16.99. Next best is $20 at Best Buy. Just Cause 2 (Xbox 360) - $15.99. Next best is $20 at Amazon. Castlevania: Lords of Shadow (Xbox 360) - $11.99. Next best is $25 at Amazon. Deal expires January 16. Rhythm Heaven Fever (Wii) - $11.99. Next best is $14 at JR.com. Marvel Super Hero Squad: Comic Combat - uDraw (Xbox 360, PS3) - $7.99. Next best is $15 at GameStop. Deal expires January 17. Band Hero featuring Taylor Swift - Super Bundle (PS3) - $44.96 plus $1.97 shipping. Next best is $119 at Amazon. Dreamcast Collection (Xbox 360) - $8.40 plus $1.97 shipping. Next best is $18 at Amazon. London 2012 - Pre-owned (PS3) - $9.99 at GameFly. Next best is $51 at Deep Discount. S.T.A.L.K.E.R. : Clear Sky (PC Download) - $2.49 at GamersGate. Next best is $10 at GameFly. Deal expires today. Crysis 2 Maximum Edition (PC Download) - $5 at Origin. List is $40. VIZIO 27-Inch All-in-One Desktop, Core i5-3210M, 1TB HDD + 32GB SSD, GeForce GT 640M LE - $699.99 at TigerDirect. Next best is $999 at Walmart. EVGA SuperClocked+ GeForce GTX 660 Ti 3GB GDDR5 PCIe Video Card 03G-P4-3663-KR - $289.99 at NewEgg. Next best is $330 at Amazon. Deal expires January 16. Samsung S23B550V 23-inch 2ms LED Monitor (Refurbished) - $148 at Buy.com. Next best is $160 at TigerDirect. Deal expires January 20. OCZ Vector SSD 2.5" 256GB VTR1-25SAT3-256G - $239.99 at NewEgg. Next best is $244 at TigerDirect. HP ENVY Phoenix h9-1300t Desktop, Ivy Bridge Quad Core i5-3570K, Radeon HD 7770 2GB, 8GB RAM, Windows 8 - $839.99 plus $9.99 shipping at HP. List is $1,120. Deal expires today. HP Envy dv7t-7200 Quad Edition Ivy Bridge Quad Core i7-3630QM, GeForce GT 650M 2GB, 8GB RAM, Blu-ray, Windows 8 - $866.24 plus $9.99 shipping at HP. List is $1,155. HP g7-2320dx AMD Quad-Core A8-4500M, 4GB RAM, Radeon HD 7640G, Windows 8 - $399.99 at Best Buy. List is $500. Deal expires today. Lenovo IdeaPad Y580 59359510 Ivy Bridge Core i7-3630QM, 1080p Full HD, GeForce GTX 660M, 8GB RAM, 1TB HDD + 16GB SSD, Blu-ray, Windows 8 - $929 at Lenovo. List is $1,349. Deal expires January 18. PS3 Slim 250GB with Uncharted 3 Bundle + $20 Gift Card - $269.99 at Best Buy. Next best is $300 at NewEgg. Deal expires January 19. Azio KB588U Levetron Mech4 Gaming Keyboard - $63.99 at Mwave. Next best is $102 at Amazon. Deal expires January 21.